In the aftermath of the riot at Little India, we as a society need to ensure that we understand the full picture and that the under-lying causes are identified and addressed. Fairness, Access To Justice, the reality of life of a Foreign Worker in Singapore – These are all issues that we need to work towards improving. Join us for an open and honest discussion on the issues. 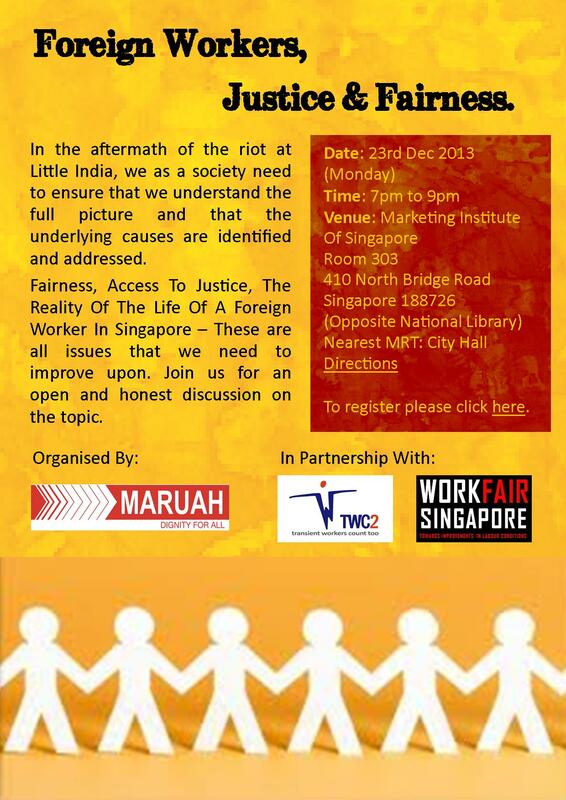 This event is organised by MARUAH in partnership with TWC2 and Workfair Singapore. This entry was posted on Friday, December 20th, 2013 at 8:28 am and is filed under Events. You can follow any responses to this entry through the RSS 2.0 feed. You can leave a response, or trackback from your own site.